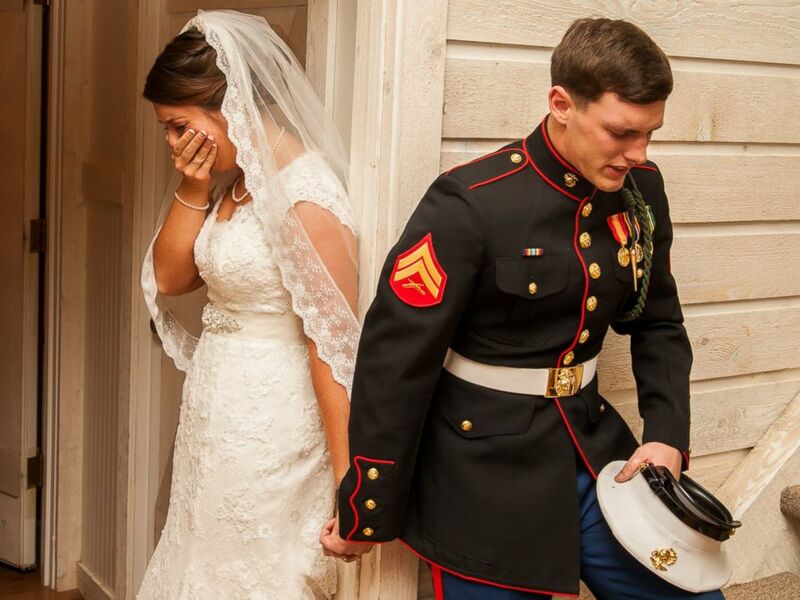 A photo of a young Marine praying with his bride-to-be quickly went viral after it was posted on Facebook by the wedding photographer. U.S. Marine Cpl. Caleb Earwood wanted to pray with his bride Maggie before their ceremony in Asheville, North Carolina, on Saturday. So with the help of their family and wedding photographer Dwayne Schmidt, Caleb was guided to the cabin where Maggie was getting ready for the service, where the couple joined hands around a corner so as not to break tradition and see each other before the altar. U.S. Marine Cpl. Caleb Earwood poses with his bride-to-be Maggie in Asheville, North Carolina. "They hid me in a room and he stepped up on the stairwell and he stuck his hand out and I grabbed his hand," Maggie Earwood told ABC News today. "As soon as their hands touched he started getting emotional," Schmidt told ABC News. "The whole room was full of emotion," Schmidt said. "I tried not to cry and focus on what I was doing." The resulting image shows the couple turned away from each other, their hands joined, as Caleb prays out loud and Maggie tries to hold back her tears. Caleb prayed for their marriage, asking that their union be strong enough to serve as an example for all young couples, Schmidt said. U.S. Marine Cpl. Caleb Earwood prays with his bride-to-be Maggie before their wedding service on Saturday in Asheville, North Carolina. "It broke me down," Maggie Earwood said, "to know that we felt the same way about God. It just made me happy." "There were no dry eyes in the room," she said. Schmidt posted the photo to Facebook on Saturday night, meant to be a sneak peek of his day's work, but it quickly garnered more than 28,000 likes and went viral across the Internet. "So many people are emailing me," Schmidt said, "saying thank you for sharing this. It's what America is supposed to be about." 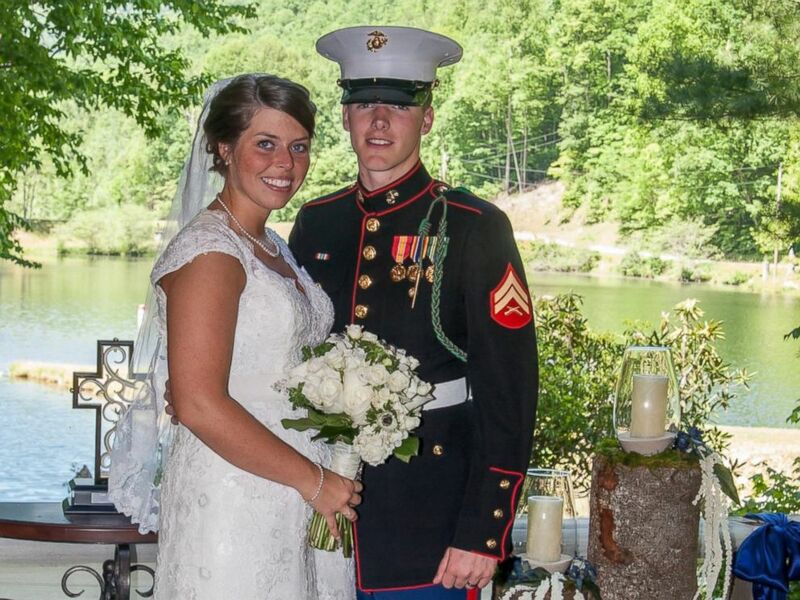 The couple is currently on their honeymoon before they return to Camp Lejeune in Jacksonville, North Carolina, where Caleb is based.